The seasons are changing and so is the time! This weekend we adjust our clocks for Daylight Saving Time. To honor the yearly ritual, we put together a list of our favorite time pieces. Here are this week’s Items We Adore: Product Picks for the Time Change. 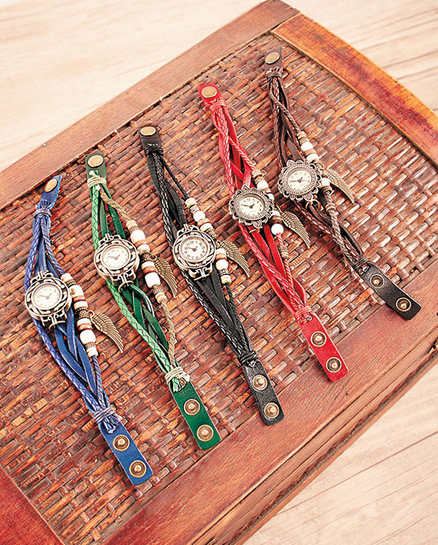 Leather Charm Bracelet Watch is a fashionable piece that works with all your casual outfits. 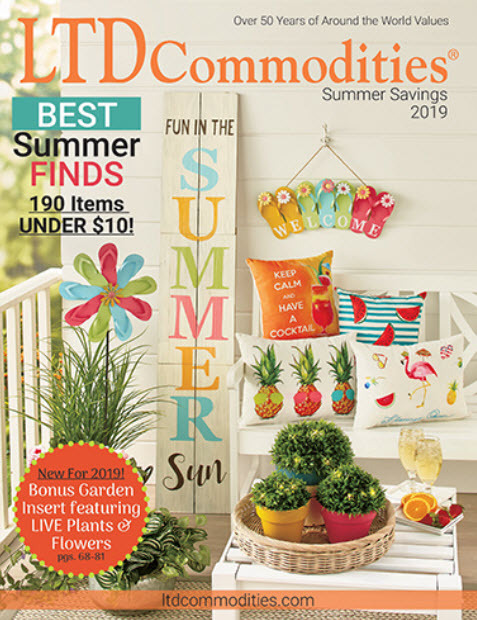 A Victorian-style border accents the watch face. The multi-layered, adjustable leather bracelet has a single wing-shaped pendant and wooden beads. 1″W x 9″L. Metal and waxed cord. 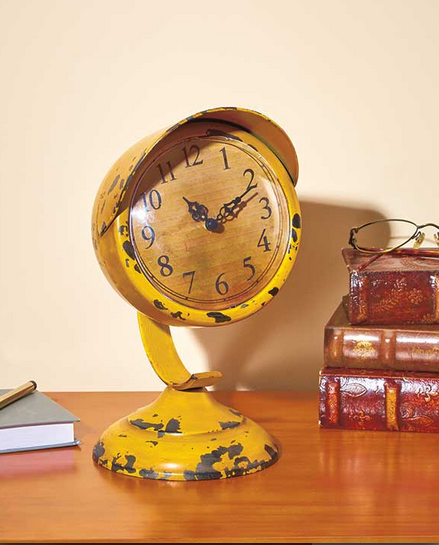 A great addition to any space, this Vintage Table Clock features a retro design. Requires 1 “AA” battery. Motorcycle Light, 6″W x 5-3/4″D x 11″H. Square with Handle, 8″W x 2-3/4″D x 9-3/4″H. Propellers, 12-3/4″W x 10-1/4″D x 10″H. Metal. 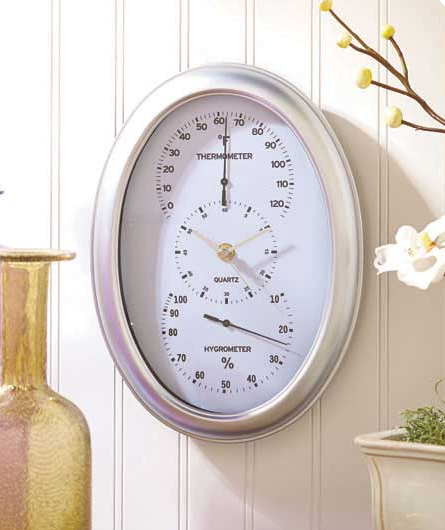 Sleek and stylish in a silver frame, this 3-In-1 Clock is actually an indoor weather station for your wall. The thermometer monitors the room’s temperature from -4 to 124°F; the quartz clock, with a step second hand and numerals from 5 to 60, displays the precise time; and the hygrometer records the relative humidity. Requires 1 “AA” battery. 8-1/4″W x 1-3/4″D x 11-1/4″H. Plastic and glass. Ready to hang. 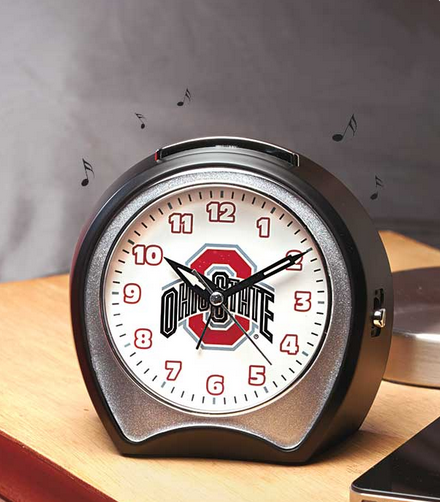 Wake up to your school’s fight song with a Collegiate Fight Song Alarm Clock! Instead of waking you with an annoying buzzing sound, this clock plays the familiar rousing song and flashes lights to the rhythm of the music. The face of the clock features your school’s logo. Has glow-in-the-dark hands and a 4-minute snooze button on top. On/off switch. Requires 2 “AA” batteries. 5-1/4″W x 3″D x 4-1/2″H. Plastic. 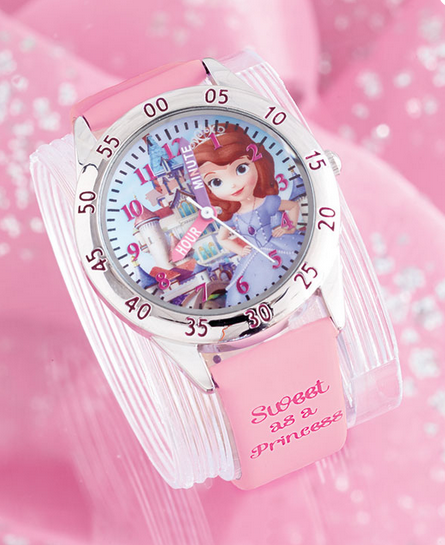 Help your little girl learn how to tell time with a Girls’ Disney Time Teacher Watch. Her favorite Disney character will make wearing this watch so much fun. The watch has labeled “Hour” and “Minute” hands and a sweep second hand. The frame of the watch face is marked in 5-minute increments to help her learn how to tell time all on her own. Includes button-cell battery. Quartz movement. Watch face, 1-1/4″ dia. Plastic strap, 8-1/4″L with 7 holes for adjusting the fit. Metal case.